A package worth £3.2m per year has been offered to communities near a new nuclear power station at Hinkley Point in Somerset. The deal, totalling £128m, will last for 40 years, which is the planned lifetime of Hinkley Point C.
Somerset County and West Somerset councils will get the money but will also share it with Sedgemoor council. The government package is separate to the £100m pledged by the developer, EDF Energy, to build infrastructure. All three councils in Somerset have welcomed the fund and local communities will decide how the money is spent. Energy minister Michael Fallon said: "It's proportionate to the scale and lifespan of new nuclear power stations and it builds on the major economic benefits they will bring in terms of jobs, investment and use of local services." Theo Simon, from Stop Hinkley Campaign, said: "It looks to me this is another case of trying to ease the way for this project which is in quite deep water and I'm not sure will be carried through anyway. "It's not a lot of money - it's talked about as if it's a sort of compensation or reward, but it's really an acknowledgement that people in Somerset still feel profoundly unhappy about the whole plan for Hinkley C.
"Rather than seeing it as compensation we should see it as a social bribe." 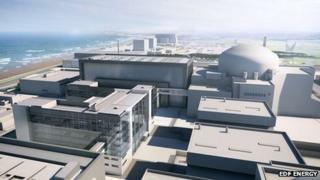 Although approval has been given, the project has stalled as EDF Energy is still in talks with ministers over what it can charge for the amount of electricity it will generate at Hinkley Point C.
For about the first 10 years the government money will be made up of business rates retained locally. Cash in the second phase, from 2030-2060, will come directly from the Department for Energy and Climate Change. "Projects of this size and complexity have an impact on local areas, it is only fair that they should see a sizeable sum to compensate them," said John Osman, leader of the county council. The sum has been based on the amount of energy the power station generates - up to 1,000/MW per annum for up to 40 years. Previously Sedgemoor District Council had been arguing for the funding to be activated during the construction phase but this was rejected by the government in May, although it was recommended by a select committee looking into the issue. Under an agreement to build and run the facility, EDF Energy is set to give £64m which will be used for education, training, transport and housing. The firm has also given a further £30m to local services for site preparation works, which started in February last year. Dr Doug Parr, chief scientist at Greenpeace UK, said: "Whilst wind farms and even shale gas developers have to pay community benefits, only nuclear stations will get a fat taxpayer subsidy to fund them. "Our entire energy policy is now absurdly distorted by the desperation to prop up EDF's faltering Hinkley C project, with the Government piling the costs on to the taxpayer to avoid the embarrassment of admitting they backed the wrong technology. "We can't go on like this."